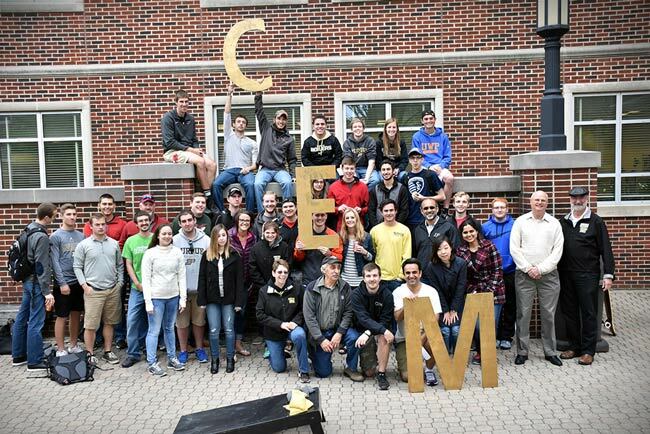 Purdue's Construction Engineering and Management (CEM) program is respected by leaders in the construction industry across the United States as one of the best—many say the best—engineering degree in preparation for a professional future in construction. Our undergraduate degree, Bachelor of Science in Construction Engineering (BSCNE), is tailored to prepare students for professional work in the construction industry. Our curriculum includes approximately 80% construction engineering and 20% management courses focused on gaining technical and theoretical knowledge. The degree is accredited by the Engineering Accreditation Commission of ABET, and many graduates go on to become registered professional engineers. A unique and essential feature of our Construction Engineering degree program is the internship requirement focused on giving our students real-world experience before graduating. Each student is required to serve three work periods in the construction industry with an approved internship sponsor firm. This service typically begins in the summer following First Year Engineering. Purdue works with each student to assign an internship location with a qualified sponsor firm. Wages and benefits always cover summer living expenses with some earnings left over each year. Upon graduation, students will have completed 36 weeks of actual on-the-job work experience in addition to their classroom work, giving them an edge in the job market. Graduates and employers consistently praise the CEM internship requirements as the best preparation for the "real world" of construction that a college student could have. The CEM student body is a close-knit group with many lasting friendships. Total enrollment averages about 130 students, with about 30-35 graduates each year. To pursue professional advancement through registration, certification, etc. If you have trouble accessing this page because of a disability, please contact the College of Engineering at webmaster-cem@ecn.purdue.edu.